According to The World Health Organization (WHO), antibiotic resistance is one of the biggest threats to global health and food security today. Antibiotic resistance can affect anyone, of any age, in any country and it occurs naturally, but the misuse of antibiotics in humans and animals is accelerating the process. Researchers had previously discovered that platypus milk confers antimicrobial protection to the species’ young. However, a new study led by scientists at Australia’s CSIRO has figured out what it is about platypus milk that’s so effective against bacteria. And it comes down to a protein. The findings are reported in Structural Biology Communications. According to Science Alert, using protein crystallization techniques pioneered at the CSIRO’s Collaborative Crystallisation Centre, the researchers were able to replicate the protein in the la and decipher its molecular structure in 3D to see where its antimicrobial properties come from. What they found was a unique, never-before-seen protein fold, comprising a unique ringlets structure – which the researchers nicknamed ‘Shirley Temple’, after the distinctive golden curls of the American child star. According to the researchers on the team, this “curly Q” feature might have evolved in the animal’s milk to help protect platypus young, who don’t feed from the teats (the platypus has none), but from milk expressed onto the mother’s belly. “That means the milk is expressed onto a milk pad where the pups lap it up and of course milk is designed to be nutritious, so anything that’s in the environment could also use that milk,” Newman explained to Radio NZ. 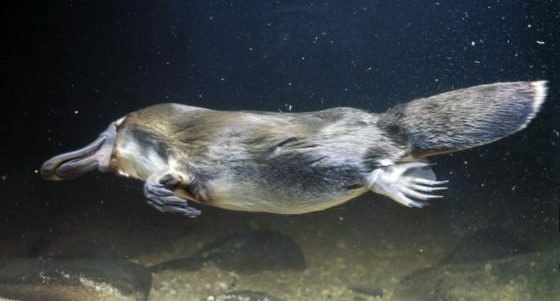 The agreed upon hypothesis so far is that the platypus evolved this new protein as a way to feed the pups while protecting them from environmental factors, like bacteria, that are attracted to milk. It’s not the first time this unusual animal has come to the aid of humanity either. In 2016, researchers discovered a hormone contained in platypus venom could actually help us develop new kinds of diabetes treatments. This article was posted in antibiotic resistance, Australian researchers, Bacteria, CSIRO, Headline News, Janet Newman, milk protein, new protein, platypus. Bookmark the permalink. Follow comments with the RSS feed for this post.Comments are closed, but you can leave a trackback: Trackback URL.